Sold by Maistruker and ships from Amazon Fulfillment. 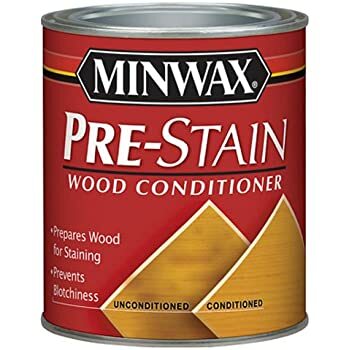 Minwax is one of the leading brands of interior wood stains in the United States. 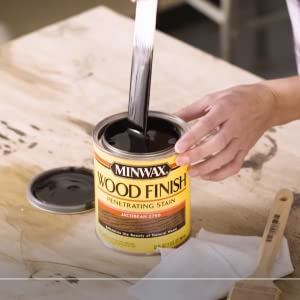 An oil-based wood stain which provides long-lasting wood tone color. Wood finish penetrates the wood pores to help seal and protect the wood. 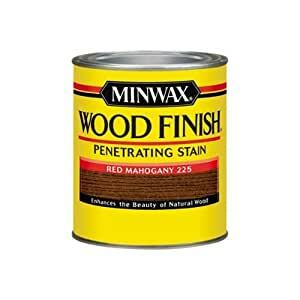 For any unfinished wood surfaces. 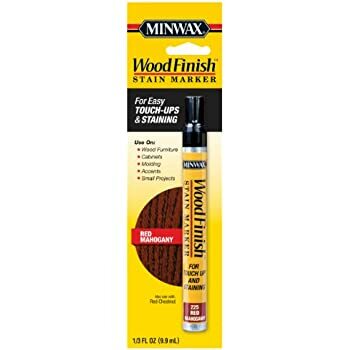 Penetrates deep into wood fibers to highlight the grain. America's favorite wood finish. 5.0 out of 5 starsIgnore the "grey" reviews!! 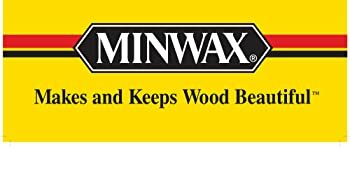 Love minwax stains! 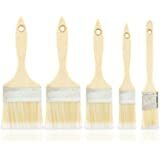 Being a painter of wood products and wood signs, I use it all the time. Love the way the grains of the wood come out when these stains are applied. I use red mahogany a lot and love the color of it on pine. 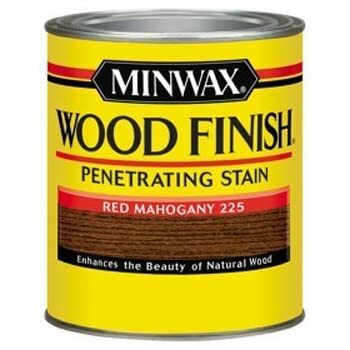 Remember different woods will take the stain differently and the look may be a tad different...this picture i listed on this review is on the red mahogany color. I've been using MinWax "Classic Gray" until now, not always loving the darkness of the gray that comes out of that stain. Classic Gray is great if you want a pure "driftwood" or beachy look, but I wanted a little bit of warmth as well. 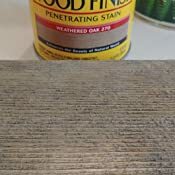 Luckily I discovered Weathered Oak just in time for my next project! It is exactly what I was looking for! It is still gray, but with just enough warmth to make the wood still look "alive." 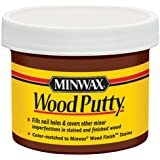 We used this to stain the top of our hand-built reclaimed wood farm table, and a week after moving the table into our dining area, I am LOVING it more and more every day. 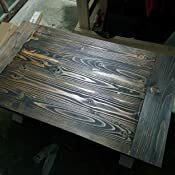 This is the perfect stain if you are going for the reclaimed look, but still want it to have a hint of warm wood tones in it as well! 5.0 out of 5 starsSuperb product. Absolutely love it! 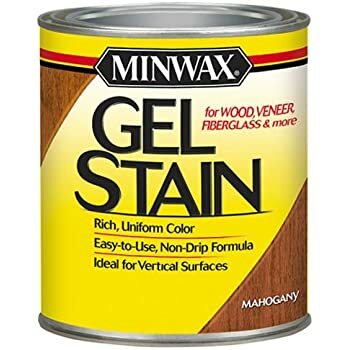 This is definitely the best stain that I have ever used. Sand and apply on my wood furnitures and they really look great! We built a shed and ended up using the Minwax Classic Grey for the top half of the T-11 siding and Varathane Carbon Grey to the shiplap bottom half. I used two coats of the Classic Grey on the T-11 because it was left unsanded. The instructions say to wipe off excess, but because it was so porous, it just soaked it all in. The shiplap did have an extremely smooth surface and so we did end up following the directions and wiping off excess. I honestly can't remember if I did 1 or 2 coats of the Varathane now. But after all that, then 4 coats of Minwax Helmsman Water Based Indoor/Outdoor Spar Urathane over everything. The picture of the shed siding is the finished result of all of that. 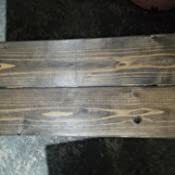 The picture of the T-11 with the 3 samples on it shows 1 coat of the following: Varathane Weathered Grey (top), Varathane Carbon Grey (bottom left), & Minwax Classic Grey (bottom right). These may end up looking differently on smooth, sanded wood, but at least you have a rough idea of what they end up looking like next to each other. 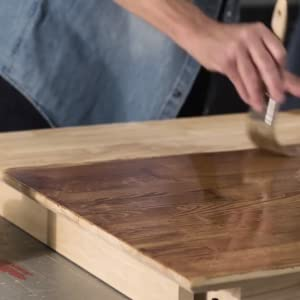 I used this stain on some small birch plywood cabinets ("Moppe") from Ikea. 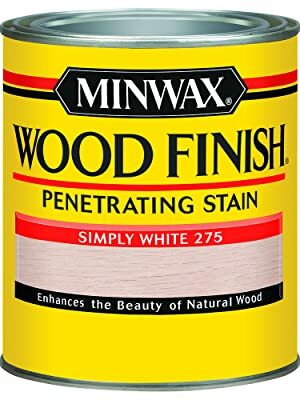 It was my first time using any stain, and it was extremely easy to apply. All I had to do was wipe on with a cloth, wipe off well, and set it out to dry. My project came out somewhat blotchy, with very natural looking constrasty grain - a very rustic look. I actually wanted a more subdued grain, and from what I understand, this could have been achieved by using a wood conditioner first. 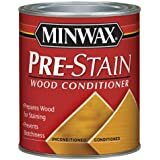 If you don't want a rustic look, you may want to look into using a wood conditioner. The stain came out very matte. I ended up applying two coats of Minwax Antique Oil finish after staining to get a little bit more shine and to add a little protection. The light gloss made the wood pop a lot more. All in all, pleased with the results. 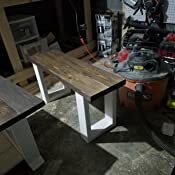 Though I like the outcome by itself, the Dark Walnut finish is very dark, has a cooler color, and did not fit in quite well with my other furniture. If I could do it again, I would choose a lighter, warmer color. If you buy this stain, make sure to pick the right color stain. 5.0 out of 5 starsPerfect, easy to use as always! 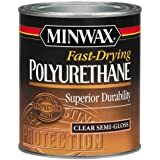 I combined this with the Minwax Fast Drying Satin finish Polyurethane (https://www.amazon.com/dp/B000VZLF58/ref=cm_cr_ryp_prd_ttl_sol_12) for the perfect look.